The idea of giving money at weddings (rather than gifts) is very traditional – old English weddings often appointed one of the pages as coin-bearer – and although this tradition is almost forgotten around 60% of couples now ask for money to help them begin their marriage. Therefore, finding an appropriate way to gather cards and money gifts on the wedding day is increasingly important. Wishing Wells come in all shapes and sizes – and whilst some are rather lovely – we have also seen lots that do seem to us to be a bit tacky. A cardboard box with a slot in the top or a fake wishing well with a silver coloured bucket doesn’t quite feel right to us – even if it is painted white with silver flowers on it! Moreover, costing between £20 and £100 (depending how much fake wood or silk flowers you have) some of these creations are far from ideal! 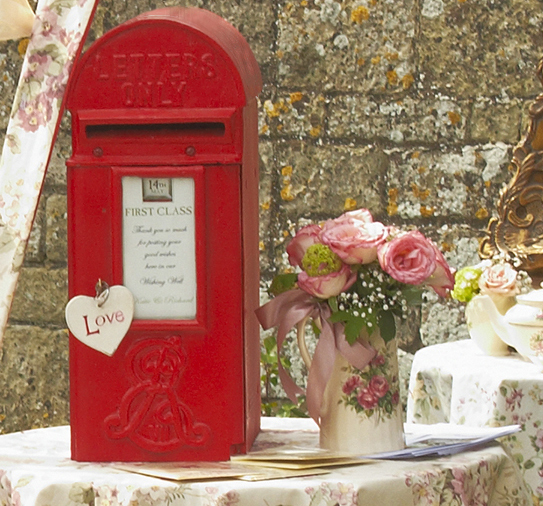 Our solution to collecting up the cards and money gifts on the day is using an old fashioned post box! We bought ours from Dorset Reclamation and it comes complete with a key and a bespoke front panel where you can include a “thank you” message from the bride and groom. Available to hire for £55 we think its a much nicer choice! It is important that guests are giving money towards something specific, for example the honeymoon. The couple should explain in an extra information sheet that is sent out with the wedding invitations when they are asking for money. 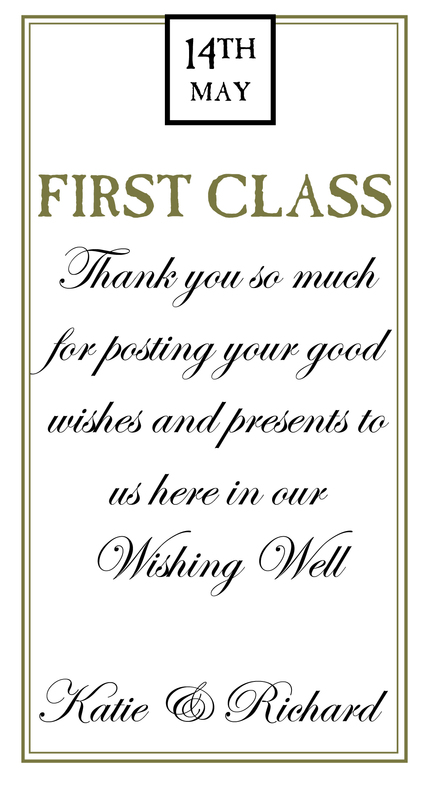 Another option is to set up a gift voucher list for one store; guests will often prefer this to writing a cheque. Finally, how much money should guests give? The standard seems to be at very least the cost of the meal you’re about to eat at the reception – with more from close family and friends and less if you’re broke..
At Chinese weddings a cha tao tea ceremony, calls upon the bride to serve tea to her new in-laws, starting with the groom’s parents then moving from the oldest to the youngest member of the groom’s family. When tea is finished, the bride takes the empty cups and in return she is given a red envelope, called a hung bao, which includes money (and sometimes jewelry). This is so lovely!